The people spots will be installed near Pastoral, Presence and True North Cafe Wednesday and Thursday. ANDERSONVILLE — Clark Street will get a few more spaces to relax this week as the Andersonville Sustainable Community Alliance adds two new people spots to the retail district. The people spots will be installed in front of Pastoral and Presence, 5214-5216 N. Clark St., and True North Cafe, 5505-5507 N. Clark St., Wednesday, said Michael Ashkenasi, Director of Sustainability Programs for the alliance. "We’re very happy to be reinstalling these public seating areas that bring some needed greenery to a neighborhood lacking in open space. 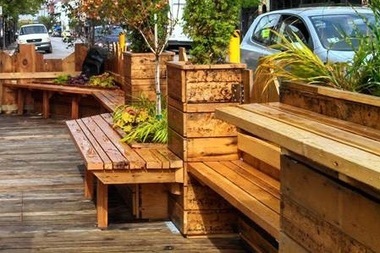 By repurposing a few parking spots, our hope is that people from the community take a moment to stop, sit, linger, chat, listen and enjoy everything Andersonville has to offer," Ashkenasi said.